I mentioned in my day-in-the-life post on Tuesday that I spent a lot of the spring trying to better myself and I attempted this by setting myself up with something new professionally. It didn't work. I'm used to moving on in my career every few years and I really felt the push that it might be time for that; lining up our career goals is always a tricky balance and I had thought it was time to explore options. In the end, it wasn't time and that took a bit of time and patience to accept. And, the one I've seen everywhere lately: If it doesn't open, it's not your door. There's a little bit of truth in all of these, which is why people rely on them as an attempt to console someone who's feeling the sting of failure. However, living by the saying that God has a plan, however true, doesn't always help you get through the day-to-day. It's helpful, yes, but impossible to envision when you're in the thick of feeling rejected or unaccomplished. For me, I see failure as a kick in the pants. Like a smack you in the face, you can't miss it kind of feeling that leaves no doubt behind about where I'm supposed to be or what I'm supposed to be doing. My strongest past example is when I met Scott, right after college. He was in the ROTC program at Penn State with one semester left. I had dated someone who was in the military back at the beginning of college. It was a difficult experience and, afterward, I really questioned why I'd been putting myself through all of that for two years; what purpose did it serve? Had I failed at something I was supposed to do? Two years after that, in August 2008, I met Scott. He told me right away that he was planning on commissioning as a lieutenant in just a few months. The pieces clicked together. I had gone through all of that as a learning experience. I was being prepared. I was getting a head start on the adult life I was going to have; I just didn't know it at the time. It wasn't a failure. It served a purpose in the long game. I have this theory that so much about what we think to be failures is really all about the long game. So, perceived failure can be used to teach us something or prepare us. A recent example, that spurned this post, is that of not getting a job I really, really wanted. We've spent a lot of time debating getting out of the army or staying in for 20 years. This past winter, I decided that, if Scott was going to get out of the army, I needed to make more money. I needed to make more money and find a job with some solid benefits because it might take him time to secure a civilian job that he wanted and would be good at. It would give us the freedom to make some choices and decisions, without having to live completely off of savings. Very long story condensed to one sentence: I didn't get any of the jobs I interviewed for. I took more rejection and hits to my self-esteem in the last few months than I'd ever taken before. I felt it, day in and day out. I would randomly burst into tears because I didn't know if I was even on the right path anymore and I didn't want to make a decision that would cause me to veer, because what if I went in the wrong direction? I was so set on getting what I wanted in the end (I was that confident), that I pushed past each rejection and onto the next. I assumed I would get what I wanted in the end, even if that wasn't necessarily what I needed. It was like I didn't feel any of the rejection because there was more opportunity blooming around the corner and I just needed to get to that. It wasn't until I hit the last rejection, the last week of April, when I realized I'd hit a brick wall. There was nowhere to go. While I could eventually accept it and go forward, I had never expected that to happen. In the end, I needed that kick you in the pants, smack you in the face, leave no trace of doubt behind that this was NOT where I was supposed to be and that was NOT what I was supposed to be doing and the ONLY way I was going to learn that lesson without questioning any decision or move I made... was for me to fail. When I look at it that way ^^^, I have a really hard time seeing it as failure. Perceived failure maybe, because I tried to do something that I couldn't accomplish or get to, but it taught me a lesson. It didn't teach me not to try again (because someday I'll probably try again), but it showed me where to go and narrowed my options of what to do with the next few years of my life and it all worked out in a sense. It came to a conclusion that I now see is 100% best for me for a few different reasons. Once I saw where this landed me, I could breathe again and I could sleep just fine. Clarity and peace are helpful like that. I won't leave you with a platitude or verse, because I know that doesn't work for everyone and some things are too hard to make sense of. I do know that everything is meant to work together. Not to work out, and not to be what's best at all times (because we have skewed definitions of what's best for us, right? Me deciding what was best for me at age 20 was not best for me and I'm glad there was a long game at work). But things are to work together for our good, whether we see it at the time or not. That's why failure is a perception. We rarely see it as just "failure" when we look back on it. failure is a part of life; in fact, failure is what teaches us important lessons and makes us grow and is what arms us to make better choices later on in life to be successful. The quote at the end is so true. 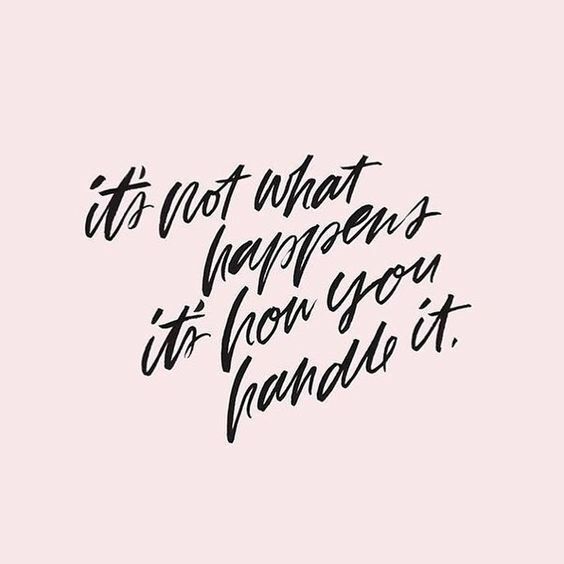 So much of what happens in life is dictated by how we handle it. Failure is necessary for growth. We learn things in failure that are not available lessons with success. Deep and emotional post.. Thank you for that opinion! I love this post so much. I feel the same way about failure and sometimes I'm just not ready for the lesson. So I don't really see it until much later. It's frustrating and can feel defeating. It's hard not to get lost in what went wrong and remember to keep moving forward.